CHICAGO, IL--(Marketwired - Mar 14, 2014) - Cool Gear International®, a global leader in housewares and hydration products, today announced new additions to its hydration, Coca-Cola® and entertaining lines at the International Home and Housewares Show (IHHS), March 15 - 18, 2014 at the McCormick Place Convention Center in Chicago (booth #S1877). 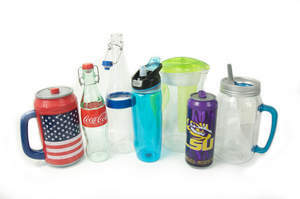 New featured products highlight popular trends such as mega-hydration, vintage mason jars and swingtop bottles plus Coca-Cola® and Collegiate licensed products. "These additions allow us to be on trend with what we are seeing in the market around hydration and consumers' demand for easier ways to get in their daily water intake," said Donna Roth, president/CEO of Cool Gear International®. "In addition to mega hydration and flavor infusion they want retro; our newly expanded Mason Jar line, Swingtop bottles and classic Coca-Cola® designs are sure to quickly become fan favorites." The new 2014 Cool Gear International® products will be on display at the show and available for purchase to retail buyers. The new items will also be for sale at select retailers nationwide starting in May 2014, except for the Filter Plus Infuser Pitcher, which is available now at Walmart and on Cool Gear International's® website www.coolgearinc.com. Cool Gear International's® new products are part of the brand's 200 patents and hundreds of products available in more than 55 countries. To learn more about Cool Gear International® and its offerings visit www.coolgearinc.com or join the conversation on Facebook at facebook.com/coolgearinc, Twitter (@coolgearinc) and Instagram (@coolgearinc). Since 2000, Cool Gear International®, Inc. has served as the leading global designer and manufacturer of innovative hydration and food storage products. With headquarters in Plymouth, Mass., Cool Gear International's talented and trendy staff delivers high-quality products at a great value. For more information about Cool Gear International®, please visit www.coolgearinc.com. Cool Gear International launches new trend-driven hydration, Coca-Cola, collegiate and entertaining products at the International Home and Housewares Show 2014 in Chicago.